Having never seen a single episode of HBO's hit series surrounding a group of friends that follow their up and coming movie star friend to the promise land of Hollywood I went into the feature film version with no expectation and no knowledge of what I was getting into. Four years after the series has ended, the film and its co-creator/co-writer/director Doug Ellin gives fans of the show a recap of what these guys have been up to while introducing newbies, such as myself, to the core characters and the molds from which they come. If you're as unaware as I then the only thing you'd probably heard about Entourage was the fact it was produced by Mark Wahlberg and was loosely based on his experiences as a naive kid from Boston learning to navigate this strange world of the wealthy that is all in the name of making movies and making a lot of money from those movies. Money is power in Hollywood and there is no greater power and yet in what is barely an hour and forty-five minute movie the glamour already began to wear thin, the pointless partying and finagling was understood to be the norm on any random Tuesday afternoon, but like most of these peoples lives, there is no substance to the going-ons of this movie that documents their exploits. What this says about the series, I'm not sure, but I know that it gives me no further interest in going back to see what all the fuss was about my junior year of high school. Instead, I'm more curious as to how much of a payoff this is for fans of the series that have been waiting for more closure or further adventures since the show wrapped in 2011. All of that said, given the premise and clear tone of what we're dealing with here, I don't know what more you could expect from a feature-length version of this kind of story. It is smarmy to the max, repulsive even in some aspects and slightly sickening depending on how much thought you care to give it. The execution unfortunately is unlike its characters in that it feels minimal and rather ordinary when, at the very least, it should be anything but that. 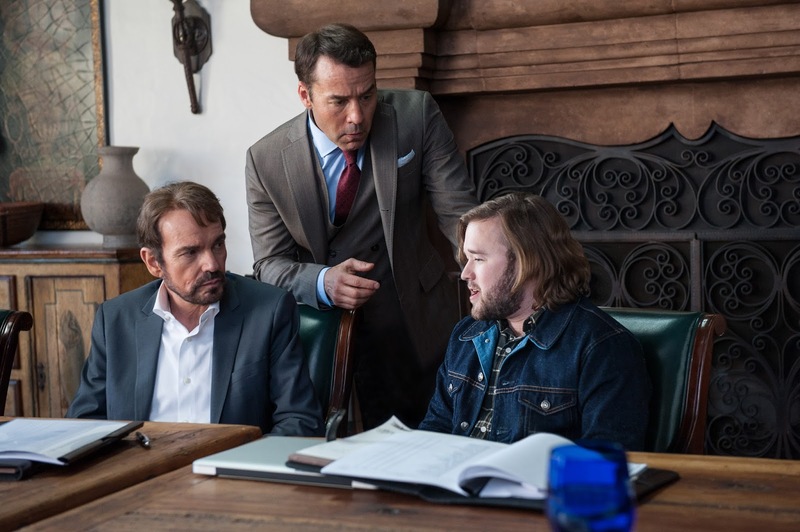 Ari Gold (Jeremy Piven) seeks to convince Larsen (Billy Bob Thornton) and Travis McCredle (Haley Joel Osment) that Vincent Chase's directorial debut is a quality film. Granted, I've never felt more ill-equipped to write a review, but the fact I like to at least attempt to see everything that gets a wide release couldn't keep me away and I'd be lying if I didn't say the trailers didn't look appealing. If nothing else, what the film has going for it is the inside look at what it might be like to learn the ropes of the business that is Hollywood and the ins and outs of what it takes to break through as well as figuring out that everyone has an angle. Given our core group of characters are well-established at this point though, E serving as Vince's manager/producer, Turtle as a constant organizer who has come into a fortune of his own with Johnny Drama continuing to be nothing short of a clinger. Johnny's arc is the most depressing given his reality will never meet his aspirations or expectations, but even this storyline is upended by giving every character a picture perfect ending. In short: much of this isn't believable and thus calls into question that single hook the film has for those not familiar with the show. The film is so avert to being subtle that the main conflict between Vince's movie and Johnny's plot is marked by the playing of The Rolling Stone's "Beast of Burden" indicating to any aware audience member that there is nothing more to take away here than what is being offered on the surface. The most interesting storyline goes to Connolly's Eric who is drawn into something of a love triangle after going out on a limb and doing something his character wouldn't typically do (as well as being partially under the influence of drugs thanks to Johnny). Eric's ex, Sloan (Emmanuelle Chriqui), is pregnant with his child and yet with only a few lines of dialogue an entire series worth of relationship drama seems to be undone. While the momentum for this sticky situation builds nicely and somewhat naturally Ellin pokes a hole in it so quickly so as to resolve all of the other character arcs in a timely fashion that there is little tension not to mention the absence of any impact in the final act that is supposed to be the catalyst to actually bring the gang back together and put their escapades into perspective. 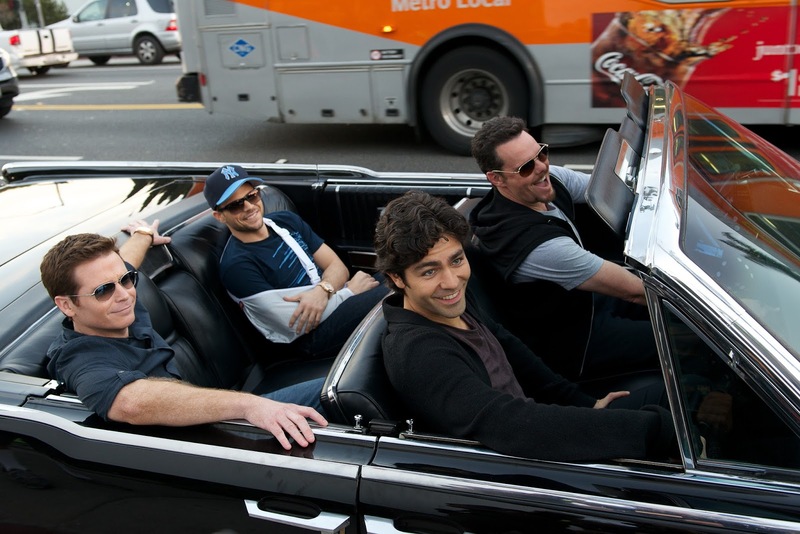 The gang from HBO's hit TV show are back in the Entourage movie. 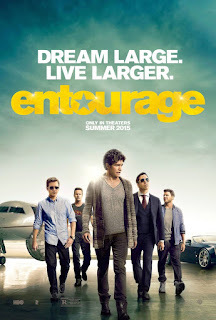 The movie as a whole takes advantage of its setting by infusing as many celebrity cameos as possible and even making an entire plot point out of the presence of one, Emily Ratajkowski (Gone Girl), but it never returns to the story her appearance begins given that seems to be the nature of any kind of relationship or connection in this world. Not only does Ratajkowski's appearance serve to simply set-up a plot point so as to, again, try to create some kind of tension later in the film, but also as a reason for Armie Hammer to show up in an amusing cameo (which isn't congruent with his real-life given he's been married since 2010 and not to Ratajkowski). Speaking of cameos (and I promise this isn't giving anything away) Turtle's entire reason for existence here is to try and score a date with Ronda Rousey playing herself. While I understand the appeal of Rousey as a strong female presence (something severely needed in a film where most of the women are little more than objects to look at and drool over) her acting is still atrocious. While I didn't mind her in last years Expendables 3 what she has done in both this and Furious 7 have been more than awful. More power to her for capitalizing on her popularity and making some extra cash, but I would have much rather seen the likes of Gina Carano in these roles.